Dress like an onion. Be sure to dress in layers. Since temperatures vary from the trailhead to the summit, a variety of insulating clothing will help you regulate your body temperature. Start small and start early. Be prepared for the distance and difficulty of the trail. The sun sets earlier in winter months so plan to be off the trail before dark. Keep in mind an injury or accident could happen any time due to terrain. Have a plan if you do get injured. Bring safety gear. Aside from basic hiking gear, be sure to include a few basic items such as your cell phone, GPS/compass, pocket knife or mini tool, first aid kit, and rain poncho and/or foil blanket. Check the weather. Look at precipitation, wind speed, avalanche reports and daylight hours. Learn to use crampons. If the trail is icy, crampons can make the difference in preventing injury. If you are new to crampons, try them on easier trails first. Let someone know where you are. Let a friend or family member know specific and accurate trail information of where you are as well as when you are expected to return. Take an experienced friend. Hiking with friends is always the way to go, especially in winter. Not only is it more fun, but also safer to be with a group. Water, water, water. It is essential to bring plenty of water when hiking in the winter, as dehydration is a common problem. Invest in good gear. There are some basics every hiker should have: crampons or snowshoes, waterproof /resistant pants and jacket, knee-high gaiters, waterproof/resistant boots, a lightweight backpack, and sunglasses. Be prepared to turn around. Legendary mountaineer Ed Viesturs once said “getting to the top is optional, getting down is mandatory.” Don’t hesitate to turn around if you run into conditions that look dangerous. Don’t hesitate to call SAR if in trouble. 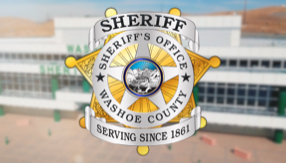 If you get lost, call 911 for Search and Rescue – Washoe Sheriff’s SAR is a free service we provide to the public. Your safe return home is our priority! Treat yourself to a great meal. Lastly, be sure to reward yourself when you come off the trials for a job well-done!